TL;DR Dynamic prospecting ad campaigns are a great, low energy way to match the right product with a similar audience. However, most marketers limit the use of DPAs to remarketing campaigns alone. Find out why this tool is invaluable for prospecting, what goes on in a good prospecting campaign and the best tips for running them. For many clients, DPAs, or dynamic ads as they are sometimes called, are synonymous with retargeting. DPAs make it easy to advertise virtually all of your products within a single campaign, with little to no maintenance. These two features make Dynamic Product Ads an invaluable tool for prospecting as well. We have seen some great success with clients using what we call “Full Funnel Dynamic Ads.” In this set-up, e-commerce stores can leverage the full power of DPAs for their prospecting audience. When executed correctly, businesses scale with less hassle from daily campaign management and can focus on other parts that are necessary for successful ventures. If you want to make full use of full funnel dynamic ads, then you must get the basics right. The principle is pretty much the same as in retargeting: match people with the most relevant products from your product catalog. The difference is apparently in the lack of direct data signals between product <-> user matches. It is recommended in this case to use broad audience targeting because Facebook’s algorithm extrapolates data from your pixel and product catalog. Facebook looks at the particular products and tries to find users similar to people who have purchased or shown interest in them in the past. Concerning broad audience targeting and prospecting campaigns, the general rule of thumb is to aim for audience sizes of at least 1 million people. To find out the answer, we picked 120 ad sets, which were used to promote more than 200 products each and had significant spend. 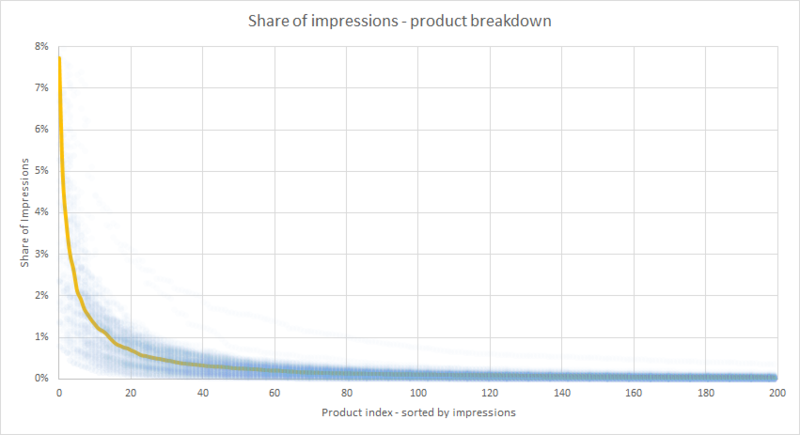 Moreover, we measured the distribution of impressions among the products inside of these ad sets. In the chart below you can see the distribution of all the analyzed ad sets and a representation of a median. Please note, that we only analyzed the top 200 products, but the median amount of promoted products is 4 500. So the long tail is a lot longer than it appears. 1% of your top products amount to 50% of impressions. On average, the top 200 products make up 70% of impressions. Try comparing this curve with the actual sales volume of products in your store. That curve is generally much more shallow, with a smaller difference between the top products and the long tail. The main takeaway is that Facebook does not display each product with the same frequency in your DPAs. As you can see, there are some campaigns in the chart that don’t experience such sharp declines - with the top product taking a reasonable 1% of impressions. These campaigns were promoting the catalog pretty evenly and saw great success. It turns out that most of these successful companies cater to a well-defined niche (e.g., young parents). On the other hand, the campaigns which saw the most significant difference between the first product and the rest were usually companies that tried to sell stuff to too many types of audiences like men’s and women’s sneakers, boots and dress shoes altogether. Facebook needs to juggle multiple expectations at the same time because it is trying to pick the right products to promote. These need to match with your target audience, and you need to win the right auctions with the right bids. All of this has to be profitable very quickly before you decide to kill the campaign. So when Facebook finds a well-performing product <-> audience match, it keeps at it, because it creates a positive feedback loop - good results from a particular audience place you in more auctions in that segment. If a product has a good track record, then it is shown again. So the best thing you can do is to create a product set based on your internal knowledge of best sellers! See, you’ve just learned that only an insufficient amount of products get a real shot at being advertised. So there is no need to keep them all in the product set! Remove everything that doesn’t perform for you in the store. Try to keep only the best products with a right balance of Clickability and conversion rate. Introduce a field in your product feed which lets you mark these healthy products. Then play around with the thresholds to find the ideal setting. These tips help you to maximize the probability that Facebook finds the best opportunities from the very start. Don’t confuse Facebook with products which fare well with different types of people. Put items which are related together into separate product sets and split the campaigns. There is no single way to cut up the catalog as long as you don’t forget to think about your audience. Divide products by gender and target age. You can try to split bargains and exclusives or segment for audiences with a specific fashion taste. However, this detailed segmentation doesn’t mean you have to narrow down the targeting as well. Always keep the audience rather broad. The standard DPA can be limiting in that you can only serve products and not whole categories. With Dynamic Category Ads, you can promote categories, brands or product types grouped. This grouping lets you have much fewer ad variations, which in turn makes it easier for Facebook to deliver them to the right audiences. Using Category ads can be a smart move if filtering and separating are not possible for any reason with your product catalog. Category ads also let you upload creatives specific to the categories and brands, which again helps a lot in staying relevant to your audience. Read more about Dynamic Category Ads here. At ROI Hunter, we think that DPAs for Broad Audience deserve more attention than they currently get. These easy to maintain campaigns can help you to consistently scale your advertising while freeing up your hands to work on other things. However, it is essential to understand how to avoid the dangers of uneven catalog promotion. Make sure that Facebook has only high-quality products to work with and that your target audience is kept consistent in your product sets. Do not hesitate to contact us if you want to learn more about ROI Hunter’s features and expertise in Dynamic Ads. Read more about Born2Be and UAE Fashion shop that worked with full-funnel dynamic product ads to get amazing results. The main takeaway is that Facebook does not give each of your products that same opportunity to be seen in your DPAs. Optimizing DPAs is not as straightforward as changing the audience or switching up creatives - things people intuitively do with conversion campaigns.